Our Diamond Award collection singles out all of our award products that have a diamond shape or have diamonds as part of the award design. The collection contains plaques, trophies, acrylic awards, glass and crystal awards, clocks and other gift items. As simple as this elegant glass award is, it still offers a lot of dimensionality and visual appeal. The beveled edges of the glass diamond serve to highlight and frame a large area for persoanlization. The silver metal "fan" accent adds color and texture in addition to it's function of holding the diamond to the black glass base. Personalize the diamond, the base, or both for your event for a stunning recognition of excellence. This stunning piece is packaged in a beautifully lined presentation box for added elegance. personalized in full color. The acrylic is a full 1" thick, and is mounted to a black acrylic base. 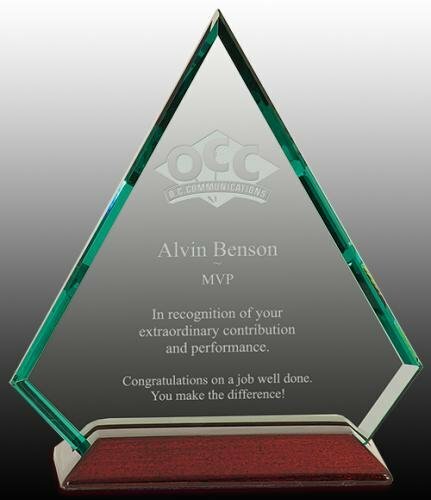 Available in 3 sizes and personalized for your event or a special milestone, this colorful award is a great way to recognize achievement.